MELBOURNE Football Club ran its Little Demons Day at Casey Fields on Sunday to kick off Round 1 of the South East Juniors football league. In a fun-filled day of footy, almost 5,000 people entered the Casey gates to participate in the event. The day was broken into a morning and afternoon session, where kids from 58 individual teams in the under 8s, 9s and 10s categories all had the chance to strut their stuff out in the middle. With a total of 76 matches taking place throughout the day, junior footballers kicked their season’s off in style, with six modified games being played at a time. While plenty of goals were being kicked on the field by some stars of the next generation, there were also a range of Melbourne players in attendance to help the youngsters have fun on the sidelines. Mitch Hannan, Jay Kennedy Harris, Joel Smith, Guy Walker and Aaron Nietschke all headed down to the Little Demons Day, along with Tyla Hanks, Casey Sherriff, Bianca Jakobsson and Shelley Heath from the AFLW squad. The Demon players participated in hand ball drills with the kids and gave away a range of exciting prizes such as jumpers, scarves, stickers and cards. 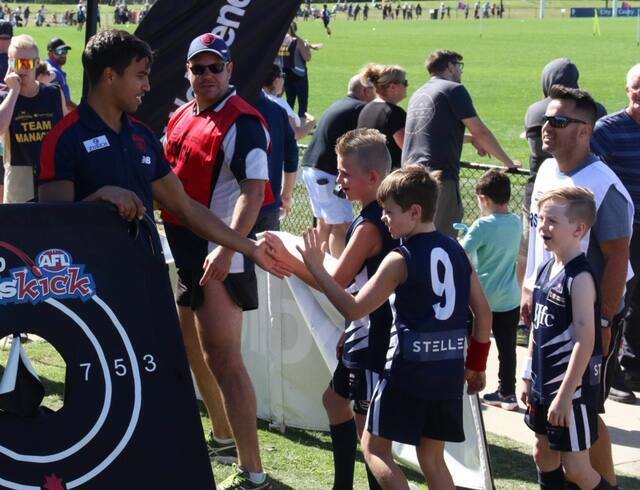 The event proved to be an overwhelming success, as the youngsters were able to rub shoulders with some AFL stars and got to play their 2019 season-opener in front of a big crowd on a quality football field.